Enjoy the Thrill of a 42 foot MTI Cat Offshore Race Boat Charter! 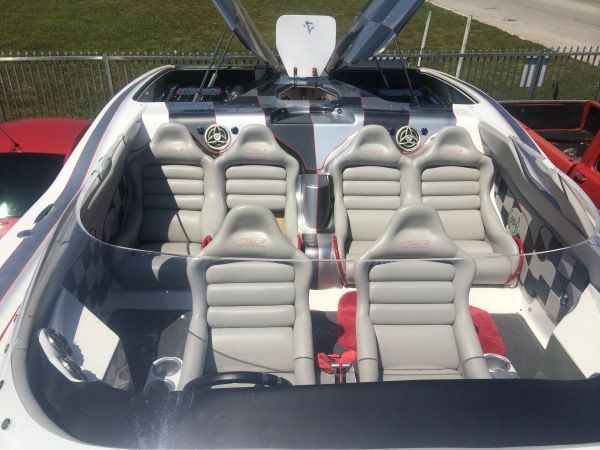 Enjoy the Thrill of Our 42′ MTI Cat Offshore Race Boat Charter! 130MPH and the Captain will allow you to drive the Boat! Not only built for incredible speed, the designers of our racing boats left nothing out when it comes to comfort. In fact, our powerboats are luxurious with stylish textiles, spacious seating, genuine leathers and stunning interiors. Going to the Florida Keys for lunch is a favorite choice of our clients. The distance is enough to put the boat through its paces and allow it to reach its maximum speed. We can head out into the Atlantic Ocean and play with the boat’s features and performance. There are world-class restaurants abundant in the Florida Keys and you can enjoy a supremely tasty lunch before heading back to Miami at extraordinary speed. Our powerboats were built for racing and they perform at their best when going full throttle. There is little more exciting than matching speed for speed. You can charter two of our speedboats and race them against each other for the experience of a lifetime. For adrenalin junkies and speed freaks, our Millionaires Concierge Race/Speedboat Experiences are the only way to see the city. Mind-bogglingly fast, they will take you anywhere you want to go in Miami and out into the Atlantic Ocean as well. We can stop for drinks, buy some souvenirs, lunch in the Florida Keys, ogle the biggest mansions and send the boat into overdrive. There is no shortage of wonder on our luxury race/speedboats in Fort Lauderdale Miami. Call today to book your Miami Speedboat Charter and experience the adrenalin RUSH of high velocity……. Learn more below, or check out our other luxury experiences in South Florida luxury yachts and South Florida Race Boats. Any accommodation can be added to your race boat package. We can have a private catered dinner arranged by some Florida’s top chefs. We can book you a luxury villa or hotel to end your experience in true style. We can help arrange luxury group or corporate events.